Bundled up on a tintype. Private Collection. An affectionate trio posing all bundled up with their overcoats, a knitted fringed scarf and a blanket. Brr! 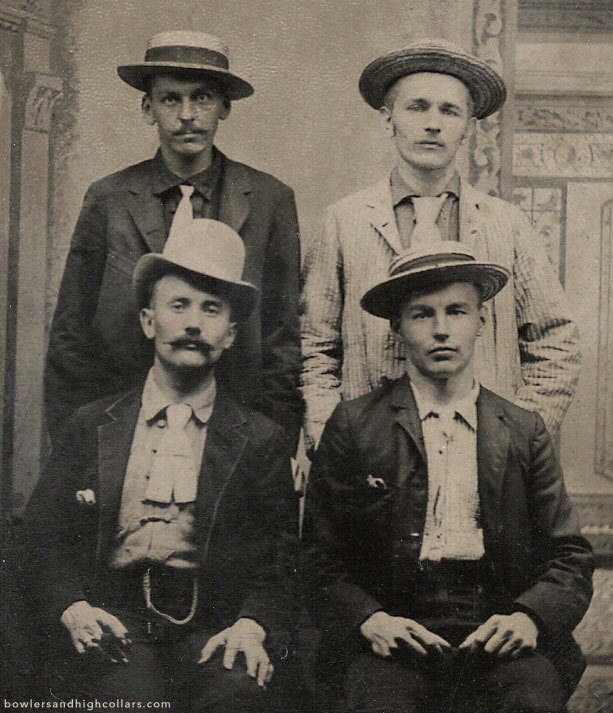 The two in front with their pork pie hat on look like they may have been brothers, the older one with the mustache. I like that the third pal in cap is resting his hands on the other two’s shoulders. There’s a good vibe out of this photograph. This tintype is a 6th plate yet is taller than average. It measures 2.5″ by 4″. Victorian gentleman with cane, top hat and mustache. Cabinet card. Private Collection. No, you are not dreaming. I’m usually not a fan of facial hair but this portrait is so much what a mature Victorian gentleman should look like I just had to get it. Under the mustache this man was a handsome fella. He looks noble with his gaze going up. Fascinating how facial hair can change one’s appearance. This gent was in his thirties at most but the mustache makes him look older. But yes, I love this one very much. See, he looks younger now. I took this quote from a great BBC article explaining the reasons why Victorian men wore beards and mustaches. A fun good read. Thank you, Mr. Gillette, I’ll never see one of your disposable razors the same way again. The back of this cabinet card is blank. Man laughing on cabinet card, by Dan Cleave. Private Collection. My starry-eyed self HAD to add this very happy gent to my collection! And my regular followers know exactly why. What a picture! Isn’t his laughter just contagious? I’m in love with this. What did the photographer tell his sitter to catch him laughing his head off like this? But whatever Dan Cleave did or say, hats off! The card has golden scalloped edges. I date this wonderful photograph to be from the 1890s to early 1900s. Photographer: Dan Cleave. Dexter. Iowa. Back is blank. 1904 Lake Hopatkong -New Jersey tourist group. 1/6th plate tintype. Private Collection. I love this casually posed group! They had their photo taken at a studio near the lake Hopatcong in New Jersey, sometime in the warmer months of 1904. The original orange sleeve came with it and is falling apart, but at least it has the name of the lake stamped on and the date in pencil. These dapper friends decided to all pose with coats off and sitting on the wood floor, so the ones in the back were on their knees! What’s funny too is the one in the middle decided to roll up his trousers’ hems, revealing some leg with the socks and sock garters (oh la la! lol). His pal with the cigar hanging off his mouth is also showing his socks. Because they’re without coats we see the sleeve garters, and the mixes of patterns on their shirts, ties and braces. And of course, the hats and smiles. Such a great group portrait! They give off the vibe of office workers (‘White Collars’ – guess that’s where the expression comes from). Maybe New Yorkers on a fun trip out of the city, the lake was a hot destination and just 80 minute from N.Y by train. At the same time that the Lake was becoming a large hotel resort, other development was also occurring. Many early visitors camped at the Lake or built crude cottages. Wealthy individuals also were learning of the Lake and building Victorian “cottages,” including an entire millionaire’s community around the grand Breslin Hotel in Mount Arlington. As with any “hot” resort, Lake Hopatcong was a magnet for many of the “rich and famous” of the day. The most famous female actress of her era, Lotta Crabtree, had a home built here in the 1880’s. Hudson Maxim, noted scientist and inventor, came here at the turn of the century and built a large estate in the Borough of Hopatcong. During the heyday of Vaudeville and Burlesque, the Lake became a favorite rest stop for performers during the summer when most theaters closed. Bud Abbot, Bert Lahr, and Milton Berle were among the many show business people to spend considerable time at the Lake. This one made me laugh some. 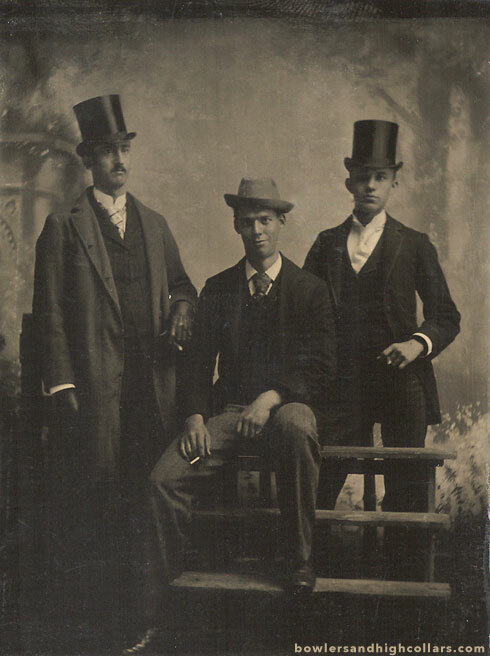 The father in top hat looks quite stiff looking straight to the side, while his two sons didn’t miss the camera, each posing with confidence. The one in the middle who appears to be the oldest of the two looks casual of demeanor, relaxed even with a smirk on his face. The youngest -I wouldn’t put past 16- is taking this occasion seriously, strutting his stuff in fine evening wear with the nice white tie. What a dandy! The dad’s gloves are so tight fitting they look painted on.